Stadium Seat Depot, Makers of Seat Feet™, manufacture Arena, Coliseum, and Stadium Seat mounting braces called brackets for Giants Stadium Seats and Chairs from The Meadowlands. 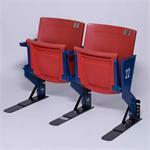 Our patented Seat Feet™ are designed to make your Giants Stadium Seat portable and stable for sitting without the need to bolt them down to your floor. Seat Feet™ come standard with rubber on the bottom that provide a protective barrier between the Bracket Feet and the floor preventing any scratching or scaring of the floor surface. Seat Feet™ are powder coated black and are designed to be used indoors or out. 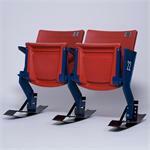 We stand behind every set of Seat Feet™ that we sell so thats why we have a money back Satisfaction Guarantee. Buy with confidence!